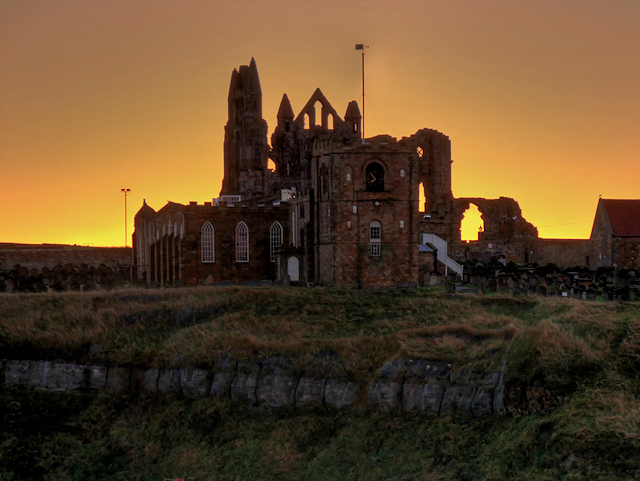 A view of the Grade I-listed St Mary's Church as the sun rises behind the Abbey Headland. The outline of the ruined abbey can also be seen behind the church. The Church of Saint Mary the Virgin is situated on Whitby's east cliff, close to the ruins of Whitby Abbey overlooking the town and the mouth of the River Esk. Church Steps, a flight of 199 steps lead up the hill to the church from the streets below. The Church was founded around 1110, although it was added to and altered over the centuries; the square, three-stage tower and transepts are from the 12th and 13th centuries. Its interior dates chiefly from the late 18th century. The church is designated a Grade I listed building (List entry Number: 1055865 Link Historic England).